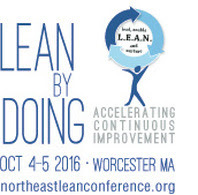 Last week I was able to join GBMP’s 12th Annual Northeast Lean Conference in Worcester, MA. The theme was on the tacit nature of implementing Lean, the importance of tying together the technical and social sides of Lean, the significance of management’s involvement and the ability of organizations to sustain the gains. I thought I would share a few highlights from this year's conference. The first presenter was Art Byrne who was instrumental in the Lean transformation at the company where I work. Art has transformed many businesses over his career and shared his formula which he described in he book Lean Turnaround. He found Lean was a strategy to run a business focusing on eliminating waste to deliver more customer value. A key element in his approach was Kaizen which is still done today at Wiremold (25 years later). Kaizen is powerful because it is key training vehicle to teach new thinking and gets everyone on board. Art explained the importance of moving from batch to flow production (where you work to takt time, 1 piece at a time, using standard work, via the pull of customer demand). I really liked his comment to all these black belts today: "
We are running a company not a karate class." With the back drop of saving lives (healthcare) he shared a compelling vision for all. Here is a video describing LEI's Lean Transformation Framework. This suggests a pathway to Lean that all can use to transform their company. There were many more great breakout sessions and lots of opportunity to network and connect with many great Lean thinkers and implementers alike. This is one of my favorite conferences. Next year's conference will be held September 19-20, 2017 in Worcester, MA. The theme is on the integration of tools and culture. Mark your calendar so you don't miss out on a great opportunity.